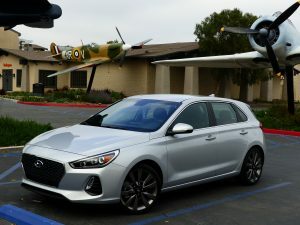 When the Elantra GT Sport M/T hit my driveway, I immediately thought of the VW GTI as a potential competitor; its just what my roadtester’s mind does when evaluating any new vehicle — “What would this compete against?” A humble Hyundai up against one of the world’s most iconic pocket rocket hot hatches? YWhy not. The packaging is very similar, both are 5-door hatchback sedans bordering on sportwagen proportions. 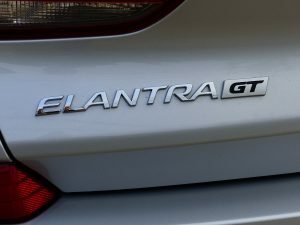 Both have all the sporty touches; contrasting red trim, beefy wheels and tires, 4-wheel disc brakes, the availability of a 6-speed manual transmission, similar size footprints, amped up suspension, grippy seats, and a turbocharged I-4 spooling out something just over 200 horsepower; to be exact, the Elantra GT Sport’s 1.6 turbo four is rated at 201 HP, and the VW’s 2.0-liter turbo four is good for 220 HP on premium gas, so the end result is very similar weight-to-power ratios. 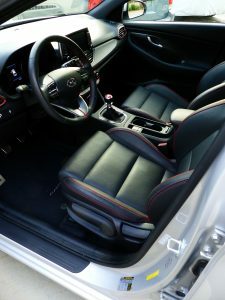 Nice place to hang out; sporty and well trimmed leather seats, good quality fit and finish, and quiet too. My tester was fully loaded in its “base” form, the only option on this unit was the carpeted floormats; everything else you’d realistically want comes standard: the big warranty, all of the sporty/racey go fast stuff outlined above, power pretty much everything, all LED lighting, plenty of technotaiment and connectivity, and so on. That’s with a base MSRP of $23,250 and a bottom line all in sticker at $24,260 including D and D, and the optional mats. 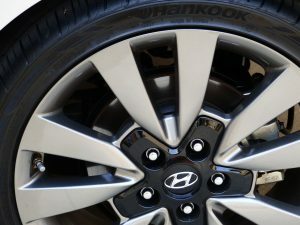 The GTI starts at $26,415 so the Hyundai already comes off as a bit of a bargain. But is it any good to drive? Modern, up to date, punchy Gas Direct Injection turbo I-4 is sweet and transforms this from econobox to hot hatch, for sure. Betcha boy howdy. I liked it even more the instant I fired the engine, hearing it rumble deeply through its dual exhaust system. 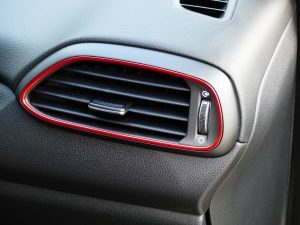 Many high performance exhaust systems sound like a chainsaw farting through a straw, but not this one, of course it’s a factory engineered system, not some crappy aftermarket tack-on muffler. 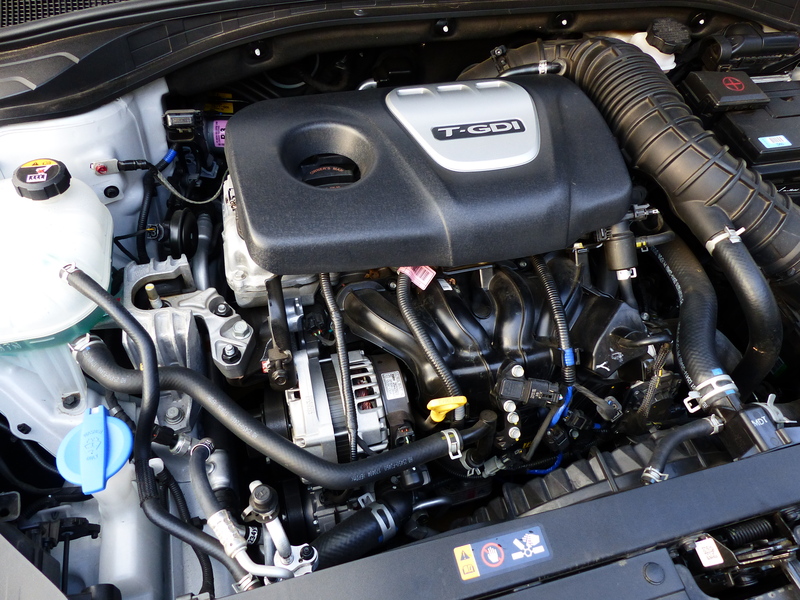 It idles with a deepish burble, and snorts ever so slightly when you rev it. Looks great, sounds great so far too. So I did what every other moron would do: I dialed up first gear on the quick and slick shifting 6-speed, and punched the gas to the mat. Wasn’t quite ready for the launch that came with it — seemed like this thing had the potential to be more than just quick, but genuinely fast. A full redline run through the gears proved that out. This little guy really hauls. 18-inch alloys look great, wrapped by capable Hankook performance rubber. 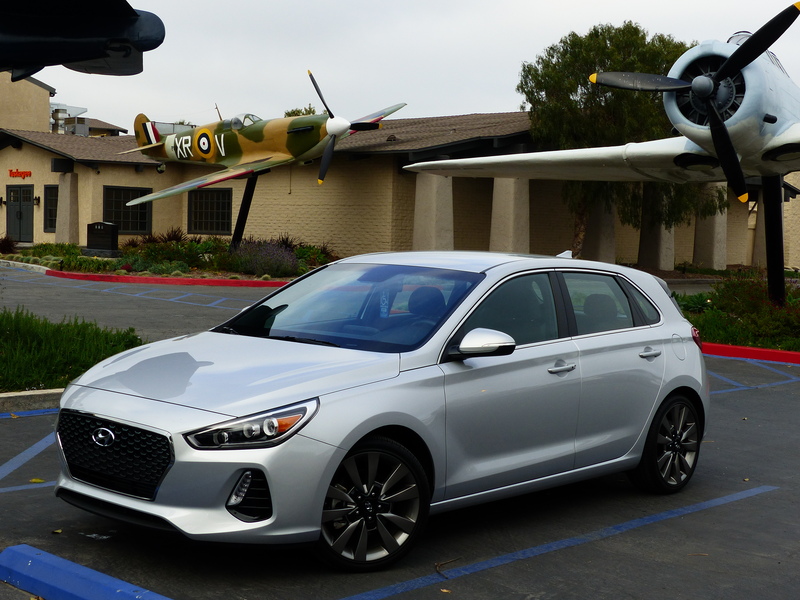 And it only got better when I bent the Elantra GT into a corner; the front end bit, the tires hung on, and the car tracked straight and true with sticky, high limit handling. OK now we’re really having fun. Time for my ultimate personal test; a 40 mile run up and down the Angeles Crest Highway, which fortunately begins and ends about five miles from my house. I think of it as my own personal Nurburgring; perhaps not as ultimately challenging as that famous German Green Hell, but a crazy good road with lots of elevation and variation through the mountains. And this little car was up to the deal; the perfectly spread ratios in the 6-speed helping keep the little turbomotor on boost and cranking power. And the chassis really works; the 18-inch rolling stock very grippy and responsive, giving neutral cornering, with a still palatable ride. Good spring rates and damping, minimal bodyroll. 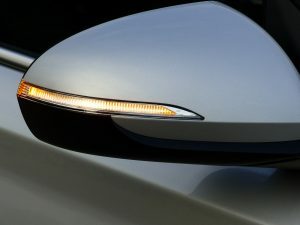 Full LED lighting front and rear, very high tech, and equally bright and clear. Clear, bright turn signal repeater lights on mirrors — EVERY car should have these. 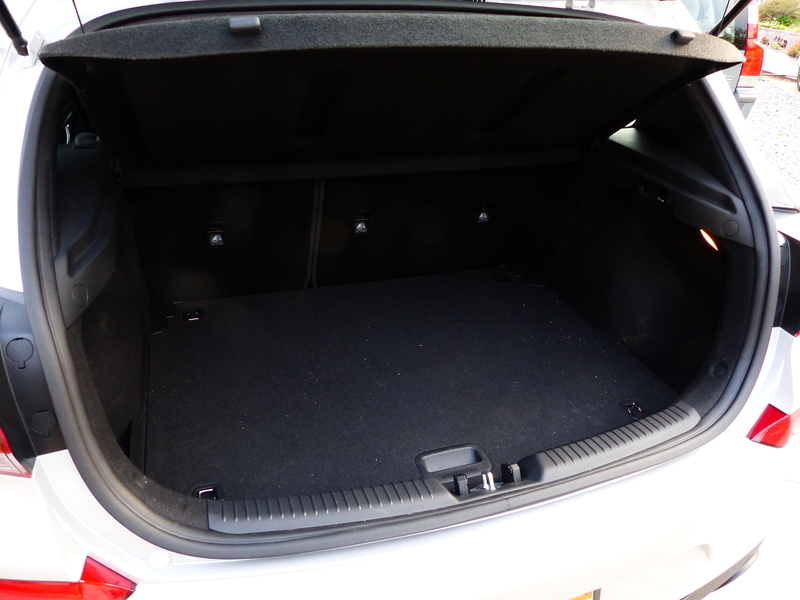 Plenty larger rear cargo area offers good access and flat load floor – nice. A good weekend trackday car right? Yes it would, and also a good weekday everyday car that’s a blast to drive. 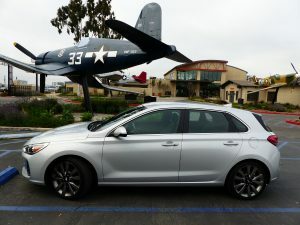 It’s comfy, has plenty of room for five people and some stuff in back, all the safety gear you need, that famous 100,000 mile powertrain warranty, good AC, good audio, enough quiet and comfort for everyday, and not an ounce of boredom. 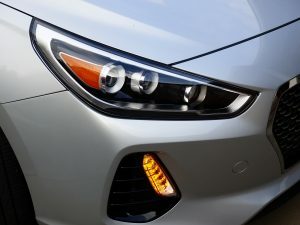 Would I buy this car with my own money? Absolutely; it’s that good, and delivers so much fun for buck. There’s obviously no such thing as a perfect car, but I honestly didn’t find anything of note I didn’t like about it. 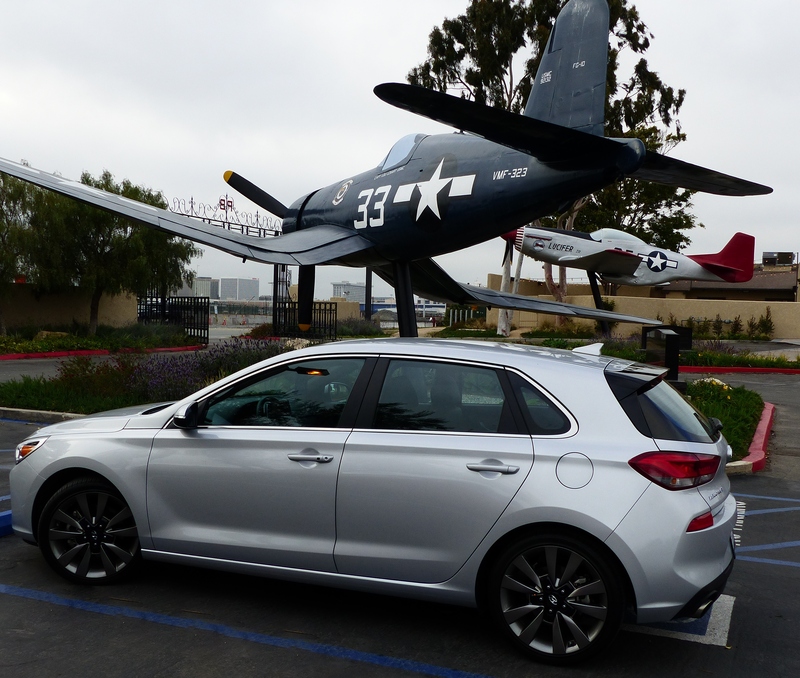 I do remember the GTI’s 2.0-liter engine having a smidge more low end torque, but not that this Hyundai suffers. And I loved the stick-and-clutch 6M trans, but if you’re a paddleshifty kind of driver, the Elantra GT Sport doesn’t have anything to match the VW’s uber slick and quick shifting dual clutch robotic automanual transmission. 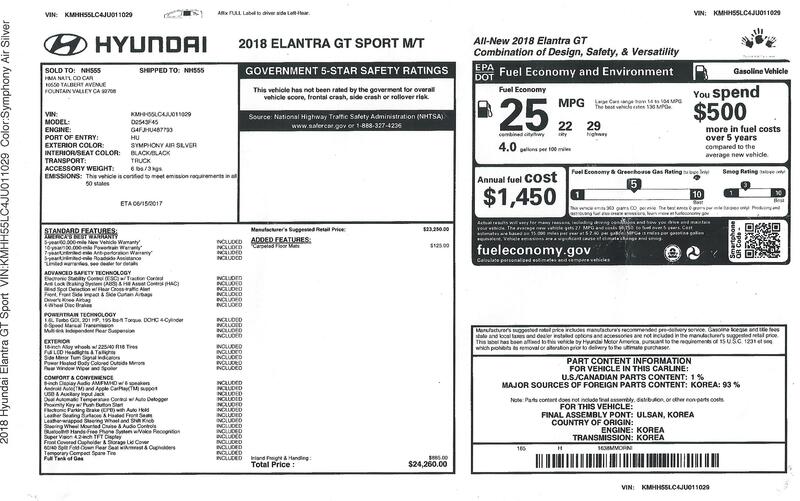 I love the GTI, but honestly if I were shopping this segment with my own dough, I’d seriously consider saving the five grand and going with an Elantra GT Sport M/T instead. Drive them both, and I think you’ll pick up what I’m puttin down.